Quarterbacks will be a major focus as the second round of the 2013 NFL playoffs get underway today and tomorrow. Of the eight remaining QBs in the playoffs, we have a few playoff vets (Peyton Manning, Tom Brady, Philip Rivers and Drew Brees) and a quartet of young guns (Colin Kaepernick, Russell Wilson, Andrew Luck and Cam Newton) hoping to make a name for themselves in these post-season contests. Four teams last weekend (Cincinnati, Green Bay, Kansas City and Philadelphia) lost their first-round games. For a couple of the QBs who lost those games, they are still looking for their first NFL playoff win. The Bengals’ Andy Dalton has now lost all three of the post-season games he’s started, while Nick Foles saw his Eagles fall to the Saints in his playoff debut. Green Bay’s Aaron Rodgers playoff record went to 6-4 with their loss to the 49ers, while former 49ers QB Alex Smith was on the losing end of Kansas City’s epic defeat to the Colts sending his post-season record to 1-2. With his team’s win over Kansas City, the Colts’ Luck won his first NFL playoff game at the age of 24 and 114 days. Of the 12 QBs that have/or will start the 2013 playoffs, he joined two others who won their first playoff game before their 25th birthday. Russell Wilson was 24 (and 38 days) when he won his first playoff game last season; Brady was 24 (and 169 days) when he won his first playoff game on January 19, 2002 with the Patriots. If the Carolina Panthers can defeat the 49ers, Newton would join that club; if they win he would win his first playoff game at 24 years and 246 days. Of the QBs in this year’s playoff who had won at least one playoff game, Peyton Manning was the QB who had to wait the longest to get his first post-season win. 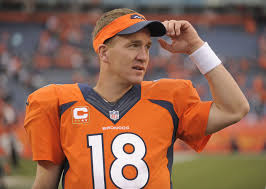 Manning was 27 (and 286 days) when he won his first NFL playoff game on January 4, 2004. He had gone 0-3 in the post-season before he won that game against the Broncos.